TATS A KOOL CHALLENGE: Whooo Hooo! 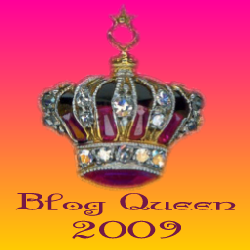 It's official...I am a Queen...and not only for a day....be it only a humble Blog Queen. Humble ...did I say humble!!!! I am deeply honoured that Lady Shuttlemaker ( she is in my blog role on the left) has deemed me a Blog Queen. 1. SEASONED; She has blogged for at least one year. 2. PROLIFIC; She writes several posts each month. 3. FUNNY; She make us smile with her witty humor. 4. ADDICTIVE; She keeps us coming back for more. Now that's just what I like, an award with no rules!!! I know that so many people now are going "no awards" on their blogs...including some of the people who have just been nominated for this award and I did think of doing the same. I love the award but not the passing it on!!! yes I know that is not the right attitude....but...I don't want to annoy anybody, or hurt anybody. Lady Shuttlemaker already picked most of the people I would have picked. To know that someone thinks that I am Seasoned (not just old!) Prolific, Funny ( I like that one the best) and Addictive really makes my day and makes all the effort of blogging worth while. Thank you Lady Shuttlemaker you have always been a lady in my opinion. Ok, Ok, I will get back to my work! Congratulations on the award! You are sooo deserving of the recognition. Aw, thank you both so much.